Have you got a spare Terry’s chocolate orange or two? Why not make a batch of these brownies? I can guarantee that these will go down a treat with whoever gets one! I know that Terry’s chocolate oranges are available all year round, so not all that festive, I know. The combination of chocolate and orange will always be a winner, that’s a fact. 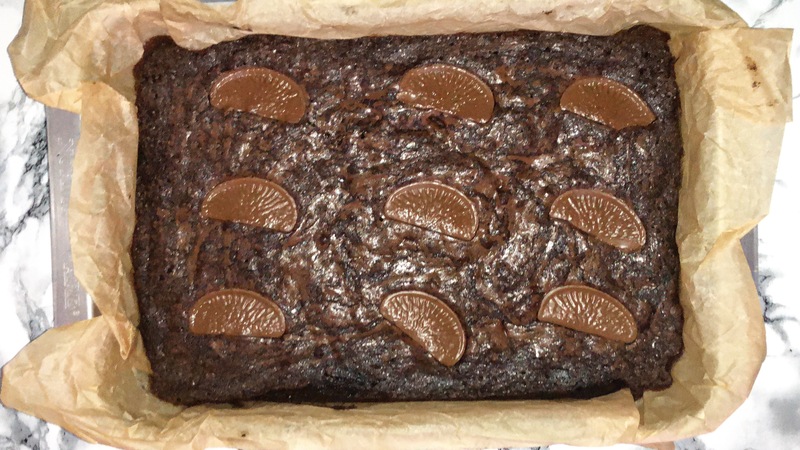 So partnering the Terry’s chocolate orange with the brownies was a great idea (especially if you like the combination). It’s not secret, I like chocolate, so who wouldn’t want to put more chocolate into the brownies?! Anyway, these brownies don’t take too long to make and will go down a treat, so let’s get into how to make these brownies. As with all my recipes, I recommend doing some prep work before you actually get into the recipe. Doing these few extra steps can save you time and prevent you from mistakes later on, nothing worse then wasting ingredients is there? Preheat your oven to 180˚c/350˚f, weigh up all your ingredients into small bowls and line your 9×13 inch baking tray. These small additional steps can save you making major mistakes and faffing around. To start on the brownies, you’ll want melt your butter. You can do this two ways, either in a small saucepan over a medium heat or place into a microwavable bowl, either method works. Transfer the mixture into a bowl, if needed then add in the cocoa powder and give a good mix until the two are fully incorporated, using a whisk is the best thing to use at this point. Allow the mixture to cool for around 10 minutes before continuing. After the 10 minutes, you’ll want to add in granulated sugar and give it a good mix until they have come together and are well combined. You will notice a change in the consistency but don’t worry it will change as you incorporate the eggs. Add in your eggs, one at a time, beating well in-between each addition. Once you’ve got all of your eggs fully incorporated you’ll notice that the consistency of the batter has changes and become much runnier and smoother, don’t worry, this is what you’re looking for. Add in your flour but pass it through a sieve first to remove any lumps that may be within the flour, then give it a brief mix, then add in the chopped Terry’s chocolate orange and mix until the flour and chocolate is fully incorporated. Don’t mix the batter anymore than you need to, otherwise you’ll over-mix the batter and result in a tougher textured brownie (which nobody wants, seriously). Once the brownie batter is complete, you can then transfer it to your lined 9×13 baking tray, getting as much as the batter in there as possible. Use a silicone spatula to scrape the bowl down, then level the batter out as best you can using a small offset/cranked palette knife or even the back of a spoon will work well. Get it to one level layer of batter, then add the 9 pieces of Terry’s chocolate orange on top (alter the amount if you’re cutting these smaller to serve at a party or something, add more if wanted. The portions I offered were large). Place the baking tray into your preheated oven and bake for 25-30 minutes or when a tester comes out with just a few crumbs on it. One thing to remember is that all ovens are different, so check at the 25 minute mark and then determine whether you need more time or not. Once the brownies are fully baked, remove from the oven and allow to cool in the tin for a short time before removing to cool completely on a cooling rack. Once they are fully cooled down, you can then cut them into portions and enjoy. They are great served on there own, they don’t need any accompaniment. Anyway, here is a (slightly) condensed version of the instructions and ingredients. 100g Terry’s Chocolate Orange, roughy chopped. Start by doing some prep. Weigh up your ingredients into small bowls, preheat your oven to 180˚c/350˚f and line your 9×13 inch baking tray with some parchment/greaseproof paper. Start your brownies by melting your butter either in a small saucepan over a low/medium heat or in the microwave until its fully melted, either method will work well. Into the saucepan/bowl melted butter, add the cocoa powder and mix it all together until it’s well combined and smooth in consistency. Transfer the mixture to a bowl if needed – allow to cool for 10-15 minutes. Once the mixture has cooled down, add in all of the granulated sugar and mix until they are combined. The texture will change, becoming more granular but this will change later in the recipe. Add in your eggs, one at a time, beating well in-between each addition. As you incorporate the eggs, the consistency will change to become more liquid-like. Once the eggs have been fully incorporated, add in your vanilla and mix to incorporate. Into the bowl, add in flour but pass it through a sieve to remove any lumps that may be in the flour. Then give a brief mix and add in the chopped Terry’s chocolate and mix them together until everything is well combined and you can’t see a trace of a single ingredient. Transfer the brownie batter into your lined 9×13 baking tray and level it out as best you can using a small cranked/offset palette knife (or the back of a spoon will work just as well). Once level, add 9 pieces of Terry’s chocolate orange onto the top of the brownie batter, then place into the preheated oven and bake for 25-30 minutes (depending on your oven, seeing as all ovens are different to one another. Once fully baked, allow to cool down in the baking tray for a while, then transfer to a cooling rack to cool completely. Once cooled down, cut your brownies into rectangles and enjoy!